Norman Julius "Boomer" Esiason (/əˈsaɪ.əsən/; born April 17, 1961) is a retired American football quarterback and former network color commentator. During his 14-year career in the National Football League (NFL), Esiason played for the Cincinnati Bengals, New York Jets, and Arizona Cardinals. Since retiring from playing, he has worked as a football analyst for ABC, HBO and Westwood One, and currently for CBS Sports on The NFL Today and Showtime's Inside the NFL. Esiason also hosts the morning sports radio program Boomer and Gio on WFAN in New York. Esiason was born and raised in East Islip, New York. Esiason got the "Boomer" nickname before he was born. His mother, reacting to his constant kicking in the womb, called him "Boomer," and he has kept the name since. His mother Irene, a singer, dancer and piano player, from whom he inherited his blond hair and blue eyes, died at the age of 37 of ovarian cancer when he was seven years old. His father Norman, a veteran of WWII, never remarried and in spite of a three hour daily commute to New York City, raised Esiason and his two sisters. His father was of Norwegian and Swedish descent; grandmother Nora Ingrid Gulbrandsen was born in Norway and his grandfather Fritz Henning Esiason was born in Sweden. His father was the cousin of Norwegian actor and singer Sølvi Wang. He attended Timber Point Elementary and East Islip High School, where he graduated in 1979. In high school, he was a three-sport varsity player in football, basketball, and baseball. Esiason played college football at the University of Maryland for head coaches Jerry Claiborne and Bobby Ross and offensive coordinator Ralph Friedgen. Maryland was the only college to offer him a scholarship. At Maryland, he set 17 school records. Esiason completed 461 of 850 passes (54.2 percent) for 6,169 yards and 42 touchdowns with 27 interceptions. He was a two-time honorable mention All-American in 1982 and 1983. In his final home game, he threw two third-quarter touchdown passes to lead a comeback victory over No. 3 North Carolina and seal the ACC title. Esiason graduated with a B.A. in 1984 and received the Distinguished Alumnus Award in 1999. 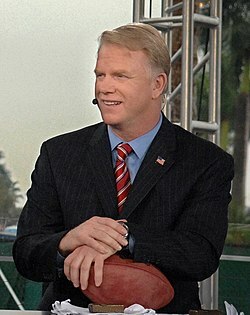 Following his final year at Maryland, Esiason was selected by the Cincinnati Bengals in the second round of the 1984 NFL Draft with the 38th overall pick, surprisingly low considering his successful college career. ESPN draft analyst Mel Kiper Jr. was, in Esiason's words, "going ballistic" that he was still available in the latter stages of the first round. No quarterbacks were drafted in the first round; Esiason was actually the first quarterback selected, as Steve Young had signed with the L.A. Express of the USFL. His USFL territorial rights were controlled by the Washington Federals franchise of the now-defunct United States Football League. Boomer got his first pro start on October 7, 1984, in Cincinnati in a game against the Houston Oilers. On a rainy day, Boomer led the Bengals to a 13–3 win over Houston and scored the game's only touchdown on a three-yard run. He took over for Ken Anderson as the Bengals' full-time starting quarterback on September 22, 1985, in a loss in Cincinnati to the San Diego Chargers and future Hall of Famer Dan Fouts 44–41. At 6'-5" and 224 pounds with a powerful arm, Esiason was the signal caller on one of the most potent offenses of the late 1980s and, though well short of Ken Anderson's rushing total of over 2,200 yards, was surprisingly mobile, rushing for 1,598 yards on 447 attempts and scoring seven touchdowns in his career. He was particularly adept at running the difficult "no huddle" offense devised by Bengal Head Coach Sam Wyche. On December 21, 1986, the final game of the 1986 season, he set a team record by throwing five touchdown passes as Cincinnati shot down the New York Jets 52–21. He also set the team single season passing record of 3,959 yards in this game. It was the last game of Bengals' quarterback Ken Anderson's playing career. After leading Cincinnati to six straight wins to begin the 1988 season, on October 16, 1988 he set a single game team record throwing 5 interceptions in a 27–21 loss to the New England Patriots. The team finished the season 12–4 with the highest scoring offense in the NFL, securing the organization's fifth AFC Central division title. He finished the season as the NFL's top rated passer. Cincinnati defeated Seattle and then Buffalo in the playoffs to reach Super Bowl XXIII, their second appearance in a Super Bowl, a rematch with the San Francisco 49ers. In the game, Bengals cornerback Lewis Billups dropped a sure interception in the end zone which would have sealed a Cincinnati win. The San Francisco 49ers, led by future Hall of Fame quarterback Joe Montana, marched 92 yards on their last drive and scored on a touchdown pass to receiver John Taylor with 34 seconds remaining in the game. A last-ditch pass by Esiason to wide receiver Cris Collinsworth was broken up, resulting in a 20–16 loss for the Bengals, their second close loss to the 49ers in a Super Bowl. On October 29, 1989, he tied his own record for touchdown passes in a game as the Bengals demolished the Tampa Bay Buccaneers 56–23. The Bengals tied a team record with eight touchdowns in the game. On October 7, 1990, he threw for 490 yards (a single game team passing record) in a 34-31 victory over the Los Angeles Rams. Esiason, who had worked with Jets head coach Bruce Coslet in Cincinnati, was traded to the Jets for a third round pick in 1993 (which became linebacker Steve Tovar), subsequently guiding their offense until the end of 1995 under three different head coaches: Coslet, Pete Carroll, and Rich Kotite. During his 1995 season with the Jets, he was seriously injured in a game played on October 8 against the Buffalo Bills when rookie Everett McIver was whistled for a false start and Bruce Smith of the Bills raced around him and caught Esiason under his face mask. Smith was terribly upset about Esiason's injury and said he never heard a whistle blowing the play dead for false start. That horrific collision gave Esiason a severe concussion, which kept him out until November 19. He is thought to have been the first NFL player to enter a concussion study during the season. When he returned to the field it was coincidentally in a game that was played against the Bills. After being released by the Jets, Esiason signed with the Arizona Cardinals as a free agent in 1996. It was during this season, on November 10, 1996, that Esiason threw for the fourth best passing yardage day in NFL history, with 522 yards in a 37–34 overtime victory over the Washington Redskins. Two weeks later he led a fourth-quarter comeback against the playoff-bound Eagles. Esiason contemplated retirement in the off-season, but was talked into playing one more season with the Bengals. Esiason was surprisingly effective after replacing Jeff Blake midway through the 1997 season, throwing for 13 touchdowns with only two interceptions and garnering a passer rating of over 106 for the season. The Bengals were 3–8 with Blake under center. With Esiason at quarterback, they won four of their last five games and scored over 30 points four times – twice they broke 40 points, in a 44–42 loss to the Philadelphia Eagles and a 41–14 rout of the Tennessee Oilers. The Bengals wanted Esiason to come back for two more years. On December 21, 1997, he played his last NFL game. His last play was a 79-yard touchdown play-action pass to wide receiver Darnay Scott. The touchdown proved the winner in a 16–14 victory over the Baltimore Ravens. He finished the season with a 107 quarterback rating. At his retirement in 1997 Esiason was among the most successful quarterbacks in NFL history, finishing in the top 10 in many statistical categories. Boomer Esiason was named to four Pro Bowl games (1986, 1988, 1989, 1993) and holds several NFL career records for left-handed quarterbacks, including most touchdown passes (247), passing yards (37,920), and completions (2,969). Esiason also led the AFC in passing in both 1988 and 1989. Among the awards Boomer Esiason has earned during his career include the NFL Most Valuable Player Award in 1988 (leading the league with a passer rating of 97.4), and the Walter Payton Man of the Year Award in 1995 for his charitable work. At his retirement in 1997 Esiason finished in the top 10 all-time in many QB career statistical categories. In addition, he is the only quarterback to hold a franchise records in single game passing yards with two different teams, having thrown for 522 yards with the Arizona Cardinals on November 10, 1996 and 490 yards for the Cincinnati Bengals on October 7, 1990. Football Nation ranks Esiason as the 25th greatest quarterback of the post-merger era. In 2004, he was inducted into the Nassau County Sports Hall of Fame. Esiason has appeared in over 25 commercials including ones for Diet Coke, Wheaties, Reebok, Samsung, Hanes, Doritos and Domino's Pizza. He has also appeared in many TV shows and movies, such as The Game Plan, Miss America 1999, Spin City, and Blue Bloods among others. He made two appearances on the game show Family Feud. On March 18, 1989, he appeared in the episode "Bengals v. 49ers", reminiscent of their latest Super Bowl match. In 1993, his second Family Feud appearance came in the episode "NFC v. AFC". He authored a children's reader in 1995 titled A Boy Named Boomer and co-wrote (with Lowell Cauffiel) a 1998 novel titled Toss. He co-hosted the Miss America Pageant with Meredith Vieira on September 19, 1998,  and co-hosted with Julie Chen the CBS broadcast of the 2002 Macy's Thanksgiving Day Parade. He and partner Craig Carton served as judges on the May 29, 2011 episode of Iron Chef America. He has co-hosted Super Bowl's Greatest Commercials from 2012 to 2019. He made a cameo appearance as himself on the October 3, 2014 episode of Blue Bloods. In 2015, he became the Commissioner of the FFL (Feline Football League) for Kitten Bowl II on the Hallmark Channel, and still holds that position today. He has provided analysis and commentary for all the Kitten Bowls since Kitten Bowl II, which airs during half time of the Super Bowl. While still playing, Esiason appeared as a color analyst on the USA Network's two-year broadcast of the World League of American Football (WLAF) on Monday nights, partnered with Brad Nessler. After his retirement from playing, he went into broadcasting full-time. He was a color commentator for ABC's Monday Night Football from 1998 to 1999. Following his dismissal by ABC (due primarily to personal conflicts between him and play-by-play announcer Al Michaels), he was hired by the Westwood One radio network to become the lead analyst for radio broadcasts of Monday Night Football and Super Bowl games. He broadcast every Super Bowl from SB XXXIV in 2000 to SB LII in 2018, a total of 19, which is a broadcast record. As planned, after broadcasting the Thursday night football game on September 6, 2018, he left Westwood One. He was quoted as saying "I’m going to miss it, but in all reality I kind of have to get part of my life back." He currently serves as an in-studio analyst for The NFL Today on CBS television, Inside the NFL on Showtime, and hosts Boomer and Gio on WFAN Radio in New York and the CBS Sports Network. In September 2012, CBS Radio announced he was added to their collection of talent to deliver five sports updates per day Monday-Friday. Starting in 2013, he began appearing once a week as a guest on The Jim Rome Show during the NFL season to break down the upcoming weekend's NFL action. In April 2007, after the firing of Don Imus, CBS Radio gave Esiason a one-week "try-out" as Imus's replacement on WFAN. The station announced him as the permanent host on August 13, with radio veteran Craig Carton joining as co-host. Boomer and Carton officially started on September 4, 2007. As an analyst with Westwood One, Esiason would do the Monday morning show, travel to do the Monday Night Football game and travel back to New York in time to do the Tuesday morning show. The Boomer and Carton radio program became the number-one rated morning show in all key demographics in the greater N.Y. listening area and was seen on the CBSN/TV Network from 2010–2013. On March 8, 2013, both Esiason and Carton worked the radio broadcast of a Brooklyn Nets basketball game. The radio program has been simulcast on the CBS Sports Network since January 2014. In September 2017, after being arrested and facing charges of operating a concert ticket Ponzi scheme, Carton resigned from WFAN, leaving Esiason as the sole host of the show, which was rebranded The Morning Show with Boomer. On January 2, 2018, the show became Boomer and Gio, when Gregg Giannotti joined Esiason as a permanent co-host. In 1986, Esiason married his wife, Cheryl. They have two children, son Gunnar and daughter Sydney. He has lived in Manhasset, New York, since at least 1998. His daughter Sydney is engaged to New York Islanders forward Matt Martin. While at a Jets mini-camp in 1993, Esiason was notified that his two-year-old son, Gunnar, had to be taken to the hospital with breathing difficulties. Soon after, Gunnar was diagnosed with cystic fibrosis, a disease of the respiratory and digestive systems. The Boomer Esiason Foundation (BEF) was formed soon afterward to fund research to find a cure for the disease. The Foundation also provides scholarships, transplant grants, hospital grants, education and awareness of cystic fibrosis as to provide higher quality of life for people with CF. The foundation has raised in excess of $100 million as of March 2, 2013, and has supported numerous hospitals, including Cincinnati Children's Hospital with the Gunnar H Esiason CF/Lung Center and Columbia Presbyterian in NYC with the Gunnar H Esiason Adult CF and Lung Program. The foundation has given over $2 million in scholarship grants to CF patients. The foundation is located in New York City and runs numerous events around the country. The Boomer Esiason Foundation annually receives four stars from Charity Navigator. In 1996, Esiason formed a partnership with Cantor Fitzgerald and Howard Lutnick (CEO) as the foundation offices were moved to the North Tower of the World Trade Center in lower Manhattan on the 101st floor. This was destroyed in 2001 in the September 11 attacks. All five full-time employees survived, as none were in the building at the time, but "Esiason figured he knew over 200 people personally" who were killed in the attack, including his best friend Tim O'Brien who was a partner at Cantor. As of 2017 Gunnar Esiason is an extremely active 26-year-old graduate of Boston College who undergoes daily treatments and takes cystic fibrosis medications. He was a quarterback for his high school football team at Friends Academy in Locust Valley, NY, and played forward on his ice hockey team for the Manhasset/Roslyn varsity hockey team. Gunnar also writes a popular blog and appears daily in a podcast discussing the issues confronting Cystic Fibrosis patients. Gunnar and his father are teammates on their local hockey team. ^ Fabrikant, Geraldine (April 26, 1998). "Talking Money with Boomer Esiason; Quarterback Lets Adviser Call the Plays". The New York Times. Retrieved September 13, 2009. ^ Eddy, Art. "Boomer Esiason - My Life of Dad". Life of Dad. Life of Dad. Retrieved September 11, 2018. ^ J. Freeman & Associates. "Boomer Esiason's real LIFE story- a life lesson learned early". J. Freeman & Associates. J. Freeman & Associates. Retrieved September 11, 2018. ^ Maurer, Tim. "Boomer Esiason: NFL Great Turned Life Insurance Advocate". Forbes. Forbes. Retrieved September 11, 2018. ^ Smith, Gary (October 4, 1993). "We're Going To Beat This Thing". Sports Illustrated. Retrieved June 13, 2010. ^ Sargent, Dave. "Lessons from Athletics: Boomer Esiason". Max Preps. CBS Interactive. Retrieved September 11, 2018. ^ "nal Football League (NFL) - Cincinnati Bengals Team Records The National Football League (NFL) - Cincinnati Bengals Team Records". Rauzulu's Street. Rauzulu's Street. Retrieved September 23, 2018. ^ "Boomer Esiason Stats". ESPN Internet Ventures. Retrieved March 10, 2014. ^ Jones, Jim (July 24, 2009). "Ridgewood 9-Year-Old's Study of Boomer Esiason Leads to WFAN Meeting". Ridgewood News. Retrieved September 15, 2009. ^ "Video: Family Feud - Bengals v. 49ers". YouTube. Retrieved February 1, 2017. ^ "Video: Family Feud - NFC v. AFC". YouTube. Retrieved February 8, 2016. ^ "A Boy Named Boomer". Internet Archive. Retrieved September 19, 2018. ^ "BOOMER'S STILL BATTLING CYSTIC FIBROSIS". Boomer Esiason Foundation. Boomer Esiason Foundation. Retrieved September 19, 2018. ^ "Toss". PW. PWxyz, LLC. Retrieved September 19, 2018. ^ "Boomer goes from sports to Miss America pageant". Deseret News. Deseret News Publishing Company. Retrieved September 19, 2018. ^ "The 78th Annual Miss America Pageant (1998)". IMDb. IMDb.com, Inc. Retrieved September 19, 2018. ^ Gans, Andrew. "CBS Thanksgiving Broadcast Has Bway Stars and Songs of "Mamma Mia!" "Rent" and "La Mancha". Playbill. Playbill Inc. Retrieved September 20, 2018. ^ "WFAN's Boomer & Carton To Guest Judge On Food Network's 'Iron Chef America' This Sunday". CBS New York. CBS Broadcasting Inc. Retrieved September 11, 2018. ^ "Symon vs. Appleman: Suckling Pig". IMDb. IMDb.com. Retrieved September 11, 2018. ^ Nededog, Jethro (January 17, 2012). "'Super Bowl's Greatest Commercials' Special Adds Hosts Jillian Michaels and Boomer Esiason, Fan Vote". The Hollywood Reporter. ^ ""'Super Bowl's Greatest Commercials 2013' to Air Wednesday, January 30 on CBS". January 3, 2013. ^ "Super Bowl Greatest Commercials 2019 Is Ready To Determine The Funniest Of All Time". CBS. CBS Interactive. Retrieved 30 January 2019. ^ Pedersen, Erik. "FILMSteven Soderbergh Q&A: Unraveling Hollywood Chaos Smollett's 'Empire' Family Deals With "Horrific Attack" A Busy Day For Pilot Orders On Broadcast & Cable This Is Us TVState Of The Union Will Bump 'This Is Us' On NBC 'Super Bowl Greatest Commercials 2018' Gets CBS Premiere Date & New Format". Deadline. Penske Business Media. Retrieved 30 January 2019. ^ Petski, Denise. "'Super Bowl Greatest Commercials 2017' Special Set On CBS". Deadline. Penske Business Media, LLC. Retrieved 30 January 2019. ^ Byrne, Craig. "Blue Bloods: Synopsis For "Forgive and Forget" – Boomer Esiason Guest Stars". KSITETV. KSITETV. Retrieved September 20, 2018. ^ Pelligrini, Christina. "Here's how to watch the Kitten Bowl, because why should puppies have all the fun?". Hello Giggles. InStyle Beauty Group and Meredith Corporation. Retrieved September 10, 2018. ^ Best, Neil. "Boomer Esiason won't return as 'Monday Night Football' radio analyst". Newsday. Newsday. Retrieved September 10, 2018. ^ Diamond Joe (March 9, 2013). "Net Worth: Boomer And Carton Shine Working Brooklyn Nets Radio Broadcast On WFAN". SportsRants.com. ^ "WFAN Morning Show TV Simulcasts To Continue". Inside Radio. Insideradio.com. Retrieved September 10, 2018. ^ Kratch, James (September 14, 2017). "Boomer Esiason reacts to Craig Carton's WFAN exit: 'It's a sad day'". NJ.com. Advance Digital. Retrieved September 14, 2017. ^ "Boomer Esiason's Wife Cheryl Esiason". playerwags.com. October 9, 2014. Retrieved March 15, 2018. ^ Fabrikant, Geraldine. "TALKING MONEY WITH: BOOMER ESIASON; Quarterback Lets Adviser Call the Plays". NY Times. The New York times Company. Retrieved September 19, 2018. ^ Best, Neil. "A trip to Mike FrancesaLand". Newsday. Newsday. Retrieved September 19, 2018. ^ "The Boomer Esiason Foundation". The Boomer Esiason Foundation. Retrieved May 9, 2017. ^ Daugherty, Paul (September 21, 2001). "Esiason mourns lost friend". The Cincinnati Enquirer. Archived from the original on January 14, 2012. Retrieved September 13, 2011. This page was last edited on 10 April 2019, at 17:19 (UTC).